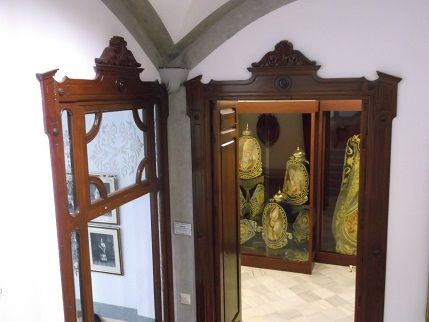 We visited the Paso Encardo (Crimson) Museum first, no pictures from this one but we did get to meet the embroiderers working in an upstairs room and in my very poor Spanish I was talking to them about what I had made as well and they were explaining their methods. It was interesting to see the work in progress, I didn’t realise that so much work is still being done there, not realising the scale of the event. The majority of the work that we saw in the museums was from the 20th century and a lot of it was very recent. The designs are drawn onto white cloth which was then laid over velvet, the design was then overlaid with strips of fluffy white cotton wadding which was couched down with tightly packed stitches, then the excess cloth was cut away. 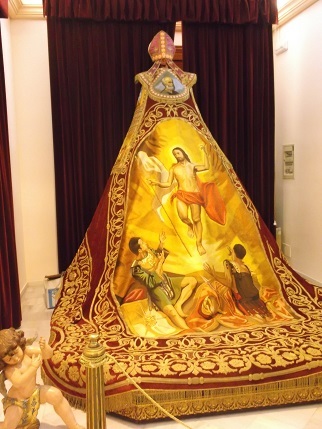 I was surprised that they weren’t using gold for padding as I have previously seen it done with gold coloured felt as the gold threads are put straight on top of the white cotton. 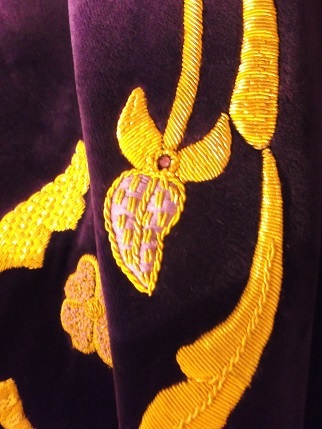 They told us that it took 3000 hours to finish one of the capes and that includes the beautiful lifelike embroidered pictures that are surrounded by the goldwork. 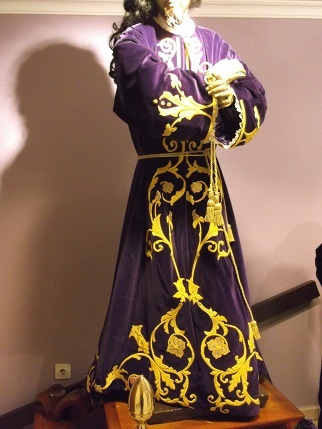 The Paso Morado (Purple) museum was next which started off with the sort of things that we were expecting to see, beautiful clothes for the icons. 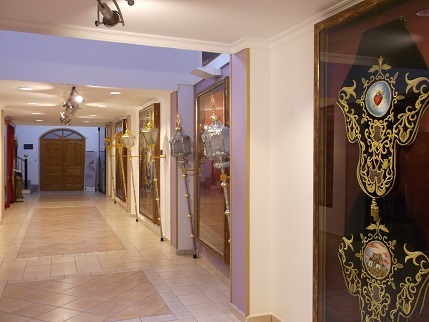 What we weren’t expecting was this a whole gallery of beautiful and amazing goldwork. 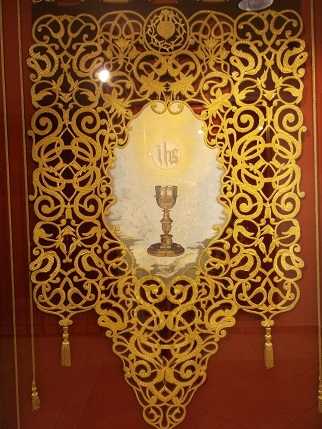 This piece was my favourite from that museum, not just the intricacy of the goldwork but the overall shape of the banner. 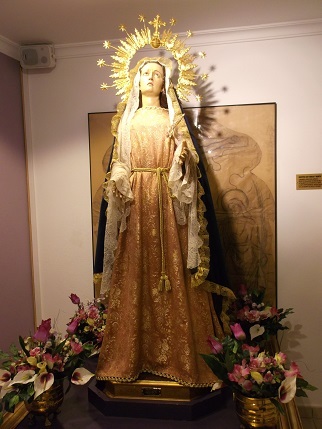 I have put some more pictures from this museum into the slideshow below. 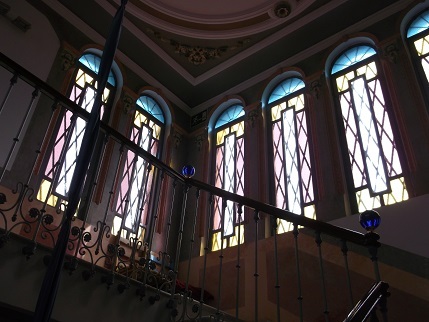 We then went to the Paso Azul (Blue) Museum a couple of minutes away which was housed in an Art Deco style house very similar to Casa Modernista in Novelda that we have visited a couple of times. 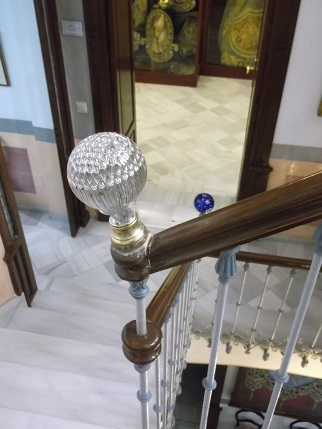 Not only was the display of capes fabulous but the building was beautiful, I loved all the newel post baubles which were all of a different style on the first two floors. 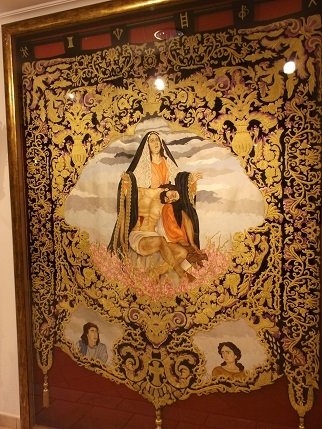 This museum was very different as they had a lot more of the horse rider’s cloaks and a lot more emphasis on the pictorial side of the work, still amazing goldwork but also Roman and Egyptian pictures and biblical scenes like this one in silk shaded embroidery. If the first cloaks the women were making took 3000 hours I estimate about 8000 for this one looking at the size of it, just incredible. 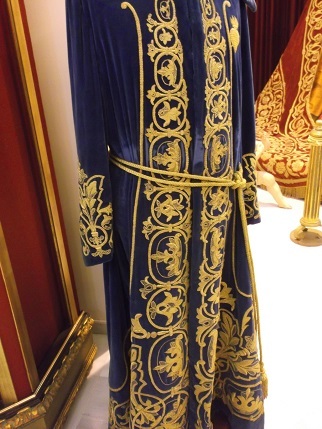 This robe was also beautiful. Again I have put more pictures into the slideshow below, apologies as some of the photos are not brilliant as all of it was obviously behind glass but you can get a sense of the amazing work. Will love you and leave you now as stitching is calling but will be back later in the week with the mind-blowing last museum, Thanks for visiting. It was but wait until you see the last one – we were in awe at the level of embroidery!